Posted on May 23, 2017 at 7:33 am. A young woman lies on the examining table, anxious and unsure. She tested positive for pregnancy, but after being seen at a local clinic, she was diagnosed with an ectopic pregnancy, a potentially life-threatening situation when an embryo implants in the fallopian tubes rather than the uterus. 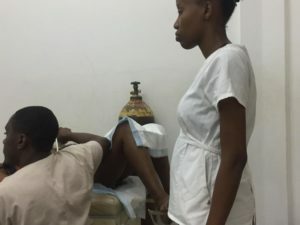 She sought help at Justinian University Hospital and arrived at the OB-GYN clinic where Dr. Nelly Osias, a dedicated obstetrician and gynecologist who heads HUFH’s cervical cancer program, and Dr. Cyril LeConte, the head of OB-GYN at Justinian, were training residents on the use of an ultrasound machine. They used the machine to examine the woman; as the images became clear they revealed something unexpected, with much better news for this young woman. The ultrasound machine is an amazing tool used routinely in the US and other developed countries. 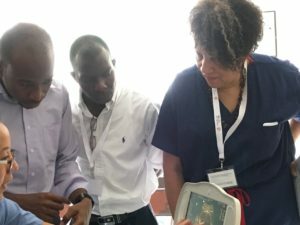 It is a piece of equipment precious and rare in Haiti, and this particular one, a portable ultrasound able to be moved to the bedside of any patient, was donated through the efforts of HUFH. 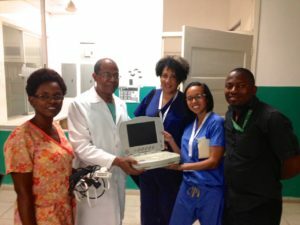 But like many things in Haiti that take time and effort before they produce good results, this machine took a journey of its own, a journey that took 18 months from the time it arrived in Haiti until it was in the hands of the doctors at Justinian, who in turn used it to help our young patient. 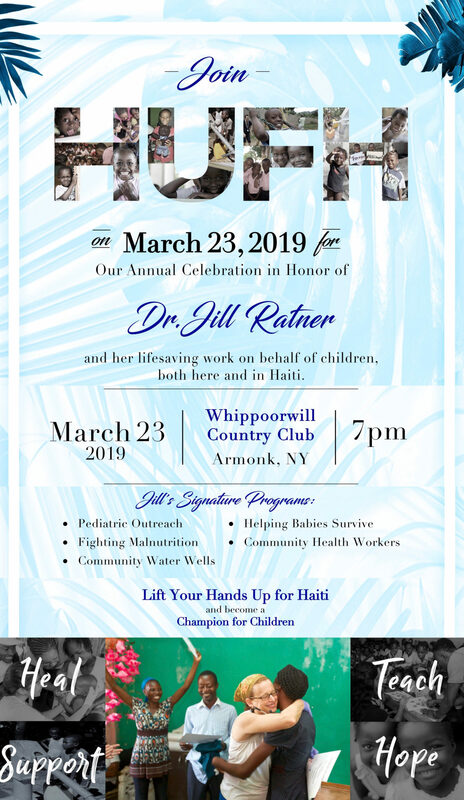 In November 2015, Dr. Judy Banks, an attending obstetrician/gynecologist at Morristown Medical Center in New Jersey, generously donated this ultrasound machine for use in the early – and frequently life-saving – diagnosis of problems during pregnancy. 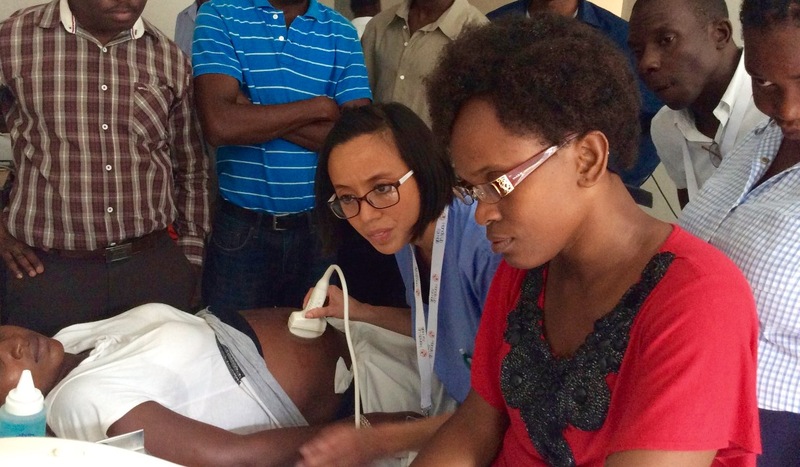 Dr. Judy Banks conducts training on ultrasound techniques. Doctors from Justinian University Hospital. 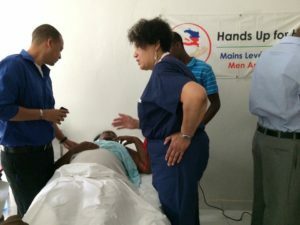 Dr. Banks led a HUFH mission to Haiti to donate the machine to our partner hospital Justinien University Hospital, a government run teaching hospital, and to hold workshops on prenatal ultrasound techniques. The mission was a great success and more than 30 doctors took part in the workshop. 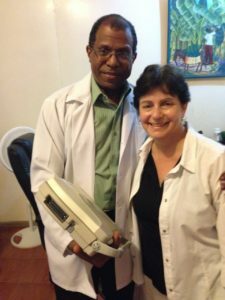 The donated ultrasound machine was placed in the care of Dr. LeConte. Dr. Nelly Osias, Dr. Cyril LeConte, Dr. Judy Banks, Dr. Liza Lizarraga, and Dr. Manol Isac. 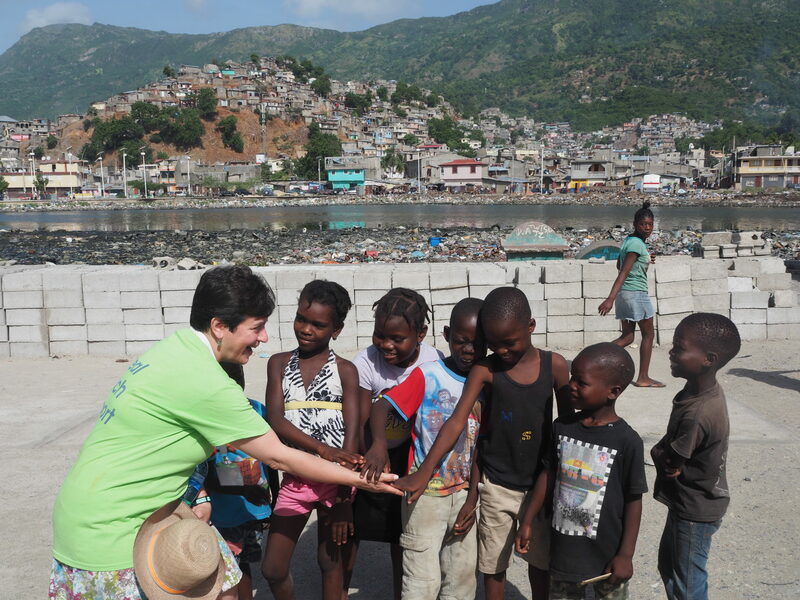 The team left Haiti believing that all was well and they had done a good thing. 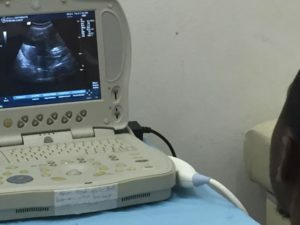 The ultrasound machine would immediately begin to help the doctors recognize breech pregnancies, or twin pregnancies, and also to help a mother know how long she had been pregnant and when the baby is expected. But after a few uses, a computer software problem occurred, rendering the machine inoperable. 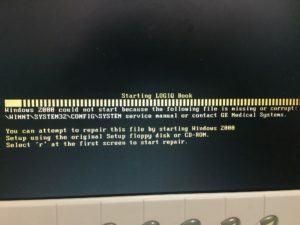 Despite efforts in Haiti and in the US to correct the software problem, the machine needed to be returned to be re-programmed by the manufacturer. Our in country team went into action and when the next HUFH team arrived, they delivered the machine to Dr. Chris Raab, an attending at Nemours Children’s Hospital heading a HUFH pediatric global health team. He picked up the machine and brought it back to Delaware. Dr. Mary Ann LoFrumento, HUFH President, traveled from New Jersey to Delaware to retrieve it. Then Dr. Banks contacted the manufacturer and sent the machine to be repaired. The tech staff fixed the software and updated it just in time for Dr. LoFrumento to bring it back with another pediatric Global Health team in May 2016. 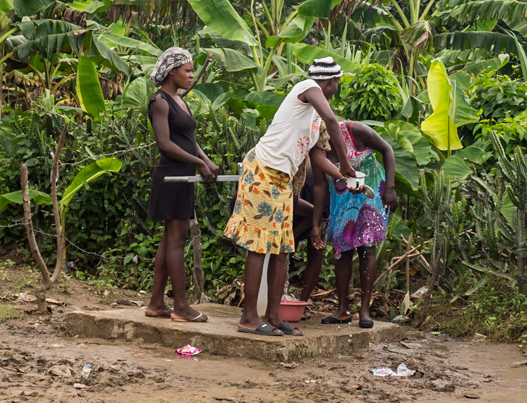 Nothing in Haiti is ever guaranteed to go smoothly. Dr. LeConte was thrilled to have the machine back and celebrated how well it was working with Dr. LoFrumento, but the machine could not be put to use: Justinien, like all public hospitals in Haiti, went on general strike while the ultrasound machine was being fixed in the US, as doctors fought for better wages and better conditions for their patients. Dr. LeConte said he would safeguard the machine in his office until the strike was over. It was not until earlier this year that the strike ended with the government acknowledging the poor conditions at the public hospitals and vowing to help the situation. The strike had caused a great deal of hardship in the country but the doctors and nurses knew they had to fight for better conditions and better pay. 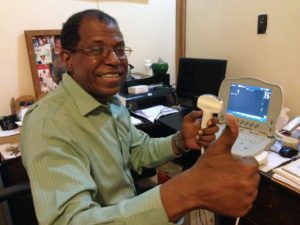 Patient care resumed at Justinian and the ultrasound machine was finally where it was supposed to be: in the hands of the residents at Justinian under Dr. LeConte’s supervision, where it is already helping to save lives. On this day, Dr. LeConte and Dr. Osias did not accept the previous clinic’s diagnosis. After viewing the ultrasound results, they decided it might not be an embryo in the fallopian tubes but rather a cyst in her uterus (a false pregnancy result because of the hormones produced). The patient was admitted and a procedure was done to remove the cyst. She left smiling and relieved of pain as well as anxiety. 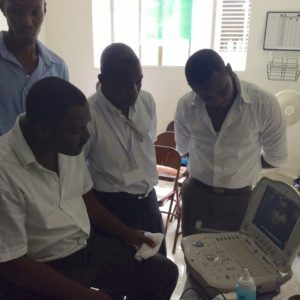 Like many things in Haiti, the ultrasound took a long and arduous journey before it ended up in the right hands. But the volunteers and staff at HUFH do not give up! Sometimes it takes a while to achieve something . . . . but with persistence, dedication, creativity and a bit of heavy lifting, the whole village accomplishes the task.